Lunch: We took the subway down to Chinatown - a place that could never exist in a modern city that didn't already have a Chinatown (no modern city health codes or zoning ordinances would ever allow something like Chinatowns in older cities like New York, Los Angeles, and San Francisco to exist; street vendors selling groceries out of paper boxes they pulled out of their trunks on sidewalk corners just doesn't seem possible unless grandfathered in). Our reason for visiting this part of the city that feels like it never developed past a certain point? 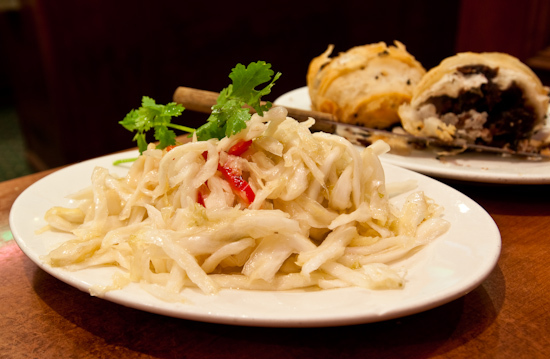 Joe's Shanghai (9 Pell Street, New York (212) 233-8888). 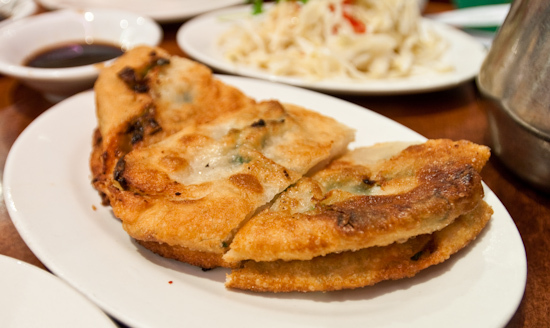 We didn't have a chance to visit their original location in Flushing, but the Chinatown location is supposed to be similar (unlike the midtown location which we've been warned against multiple times). 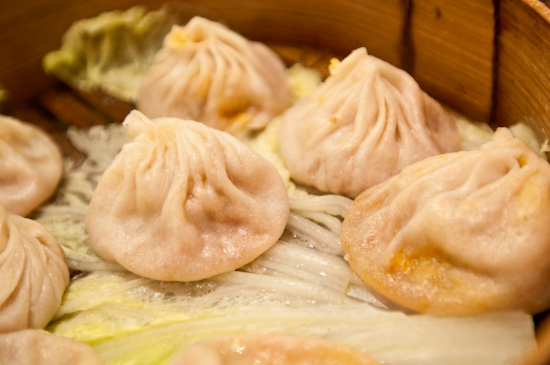 We went to taste their xiao long bao - according to some, the best in the United States (and some say anywhere outside of Shanghai). I haven't heard much about the rest of their food and didn't get a chance to taste much besides the xiao long bao which I can now vouch for as excellent. We ordered two different types of xiao long bao (which were very large - bigger than any we've had before; we joked they should be called da long bao since they were not "small steamer buns" but "big steamer buns"). Crab and Pork ($6.65 for 8 dumplings) and Pork filled ($4.65 for 8 dumplings). 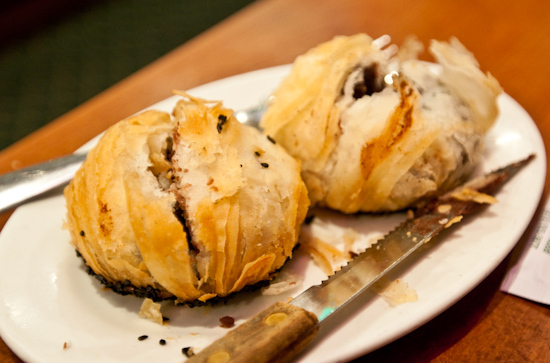 Both were served piping hot and filled with the most flavorful and rich soups imaginable. The skins we both tender and strong (able to hold the ample quantities of soup and meat filling). Everything, I've ever looked for in a xiao long bao was present in the ones from Joe's Shanghai, an experience I have never had before. These were everything I could ask for (at a great price too). There is currently a debate that Nan Xiang Xiao Long Bao makes a better soup dumpling than Joe's Shanghai, but without having tried Nan Xiang or Joe's Shanghai in Flushing, I have to say that the ones we had today at Joe's Shanghai in Chinatown were the best I have ever had. 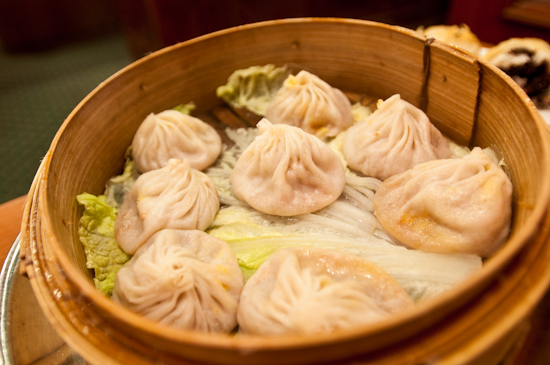 On our next trip to New York, I'm going to have to make it a special point to go to Flushing and experience the original location and Nan Xiang Xiao Long Bao to see if xiao long bao can be made even better, but, for now, I am more than satisfied with the ones I got to eat today. Sliced Pickled Cabbage ($4.65) wasn't worth it. Crunchy, but overly sweet. Homemade Sweet Red Bean Short Cake ($4.50 for 2) had a crust that was more dense and chewy than we expected (we were looking forward to a flakier, lighter crust), but the red bean paste was exceptionally good. It was sweet, but not sickly sweet like many canned red bean pastes can be. Also, unlike the canned bean paste we normally find, the paste they used was a bit more grainy and reminded Tina of the flavor and texture of the ones her grandmother made. Dinner: After Mary Poppins, we took the Subway down to Ippudo (65 4th Ave, New York, NY (212) 388-0088) to try their ramen. 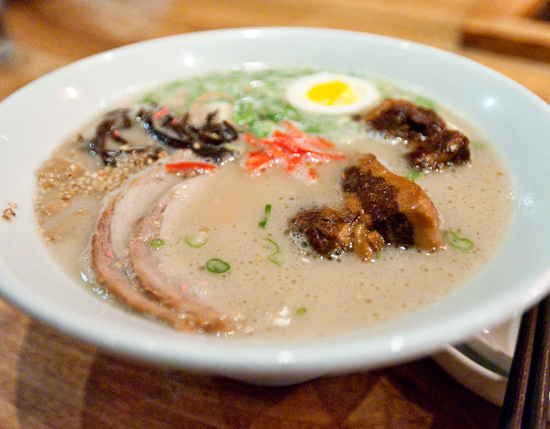 We had originally planned on going to Hide-Chan Ramen which has recently shown up in several lists of the best things to eat in New York probably due to an outstanding review by Serious Eats last month. Unfortunately, reading recent reviews (during the last week), I learned that everyone's experience as been subpar starting two week ago when rich pork broth was no longer offered (only the light pork broth) and other selections had been removed (like the chewiness of the noodles), probably due to the increased popularity of the ramen and the proprietor's desire to streamline the cooking and preparation process. 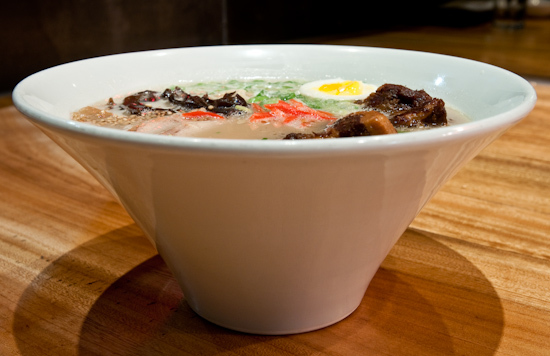 In many of the reviews I read, people used Ippudo as a comparison point, so we decided to try their ramen. 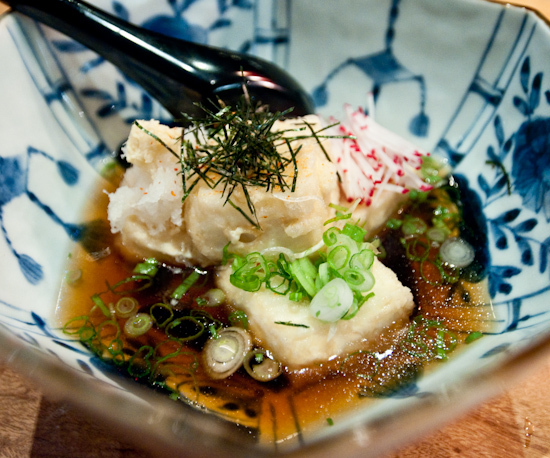 We started with an order of their Agedashi Tofu ($8) which was delicate and flavorful when paired with the broth and toppings. I had the Shiromaru Hakata Classic Ramen 'The original tonkotsu' soup noodle with pork loin chashu, kikurage, menma, 1/2 boiled egg, red pickled ginger, sesame & scallions ($14) with Kakuni pork belly (+$4). The broth was excellent and the boiled egg was superb. The noodles were a bit too thin for both Tina and my taste - we prefer slightly thicker and chewier ramen noodles. We found out that they used to serve thicker noodles, but only a few days before had switched all their ramen to thinner noodles. Our server didn't know why. The pork belly was very good, but the chashu was ridiculously bad. Mine slices had that pork taste that I absolutely loathe… I associate the taste with reheated, poor quality pork and I just don't know how to describe it otherwise. It was also insanely dry and chewy - if it was any drier, it could be shredded to make rousong (Chinese pork floss - which is exactly what I needed to get the dried bits out from between my teeth). I left the chashu and ate the rest. One interesting thing was that they had a lot of different ramen bowls. Tina and I had the same some (we both ordered the Shiromaru) so they may have different bowls for each type of ramen ranging from the traditional to those with modern or artistic curves. The unique bowls fits with the overall theme/feel of the restaurant. We sat in white armchairs with one arm missing so if pushed together it would be a mini loveseat and in front of us was a mirror and a pit filled with what looked like burnt logs. The whole place is very trendy and hip and feels more like a twenty-something night time hangout than a cozy ramen-ya. Yamitsuki Goma Kyuri Japanese cucumber mixed with sesame oil dressing ($8). 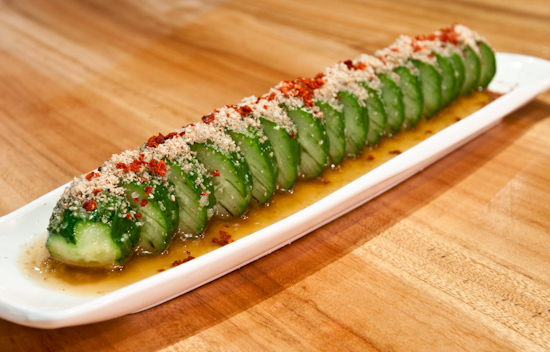 The cucumber slices were refreshing and unbelievably crunchy. Although many New Yorkers wrote reviews alluding to the fact that Ippudo was a "cheap" dinner, I don't think I've ever paid more than $10 for a bowl of ramen of similar or higher quality. Certainly, I would rate Santouka Ramen (both in LA and San Jose) as the best I've had (although I hear the New Jersey location is a little more expensive that what I'm used to, it's still $4-5 dollars cheaper than Ippudo), and Ramen Halu in San Jose has a broth that can easily rival Ippudo's tonkotsu.